Which Light Has The Best Lumen Per Dollar Ratio? If you're looking for the best deals in the world of LED flashlights, look no further. We've taken the liberty of crunching the numbers for you, coming up with our list of lights with the very best lumens per dollar ratio. Unsurprisingly we found that most of these lights are already best sellers and fan favorites, owing that to their high output and relatively low cost. In the market for a hand-held searchlight? We've got em. Tactical style? EDC? You'll find those here too. These are indeed the best of the best when it comes to pure LED lighting value. The day has finally arrived where we have a triple digit Lumen per dollar ratio. 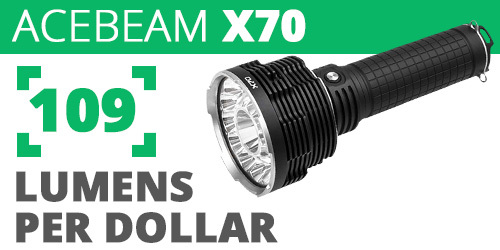 Ranking in at a ridiculous 109 Lumens Per Dollar, our newest Acebeam X70 takes first place with a bang. This monstrous LED searchlight features an array of thirteen CREE LEDs, and along with a wide reflector it produces an unprecedented 60000 Lumens! The considerable output of the light is focused to reach a mindblowing 3700 feet (1,225 Meters.) The Acebeam X70 is quite compact for its output level, making it an ideal searchlight for emergency situaitons! 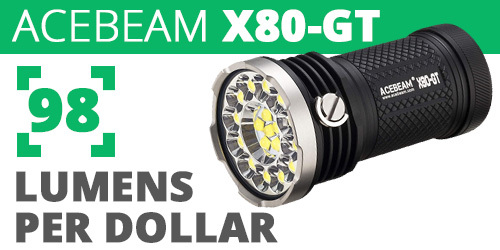 While it may not share the insane ratio of it's sister light, the Acebeam X80-GT is no slouch, offering a high lumen experience along with a high value 98 Lumen Per Dollar rating. No bigger than a can of soda, this titan of a torch uses its 18 high-performance LEDs to weigh in at 32500 Lumens of light and a beam that can reach over 400 yards (365 Meters.) Built to last, the X80-GT is a worthy second when it comes to getting true brightness for your buck. This year looks to be a homerun for Acebeam, being the first new brand to feature flashlights that took the top 3 on our Lumens per dollar list. 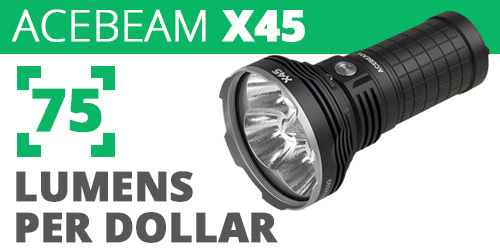 The Acebeam X45 clocks in at an impressive 75 Lumen per Dollar rating sporting a rugged build that throws over 6 Football fields (540 Meters) and outputs a whopping 18000 Lumens. This combination of power and portability makes the X45 ideal for search and rescue and other tactical operations. With a max output of 12000 lumens the Smith & Wesson FS RXP isn't just one of the best lumen per dollar flashlights, it's one of the brightest handheld searchlights period. 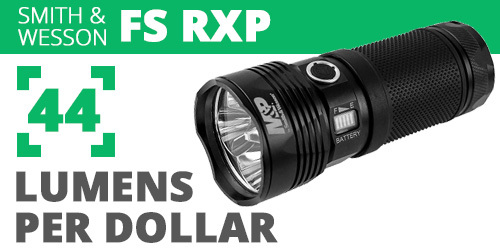 Ranking in with 44 Lumens per dollar, the FS RXP is an ergonomic slim style searchlight that finds itself at home for casual or emergency use. An easy to use side switch interface makes it easy to switch between all 7 modes and brightness settings that is complimented with a textured rubber exterior that provides a secure grip even while wet. 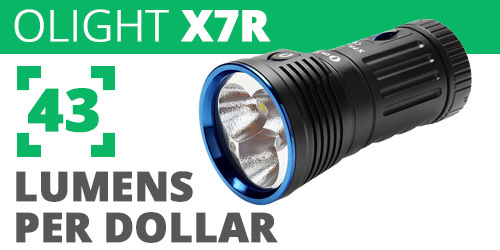 The Olight X7R offers a fully rechargeable experience along with a high value 43 Lumen Per Dollar rating. The X7R features upgraded LEDs that allow it to reach an impressive 12000 lumen output and a mind-blowing 1246 foot beam distance! The X7R comes equipped with charging cable, holster, lanyard and an integrated battery pack that keeps it easy to power up your flashlight whenever you need to. A unique sliding USB port keeps the internal electronics safe from all weather - making the X7R a flashlight for all occasions! 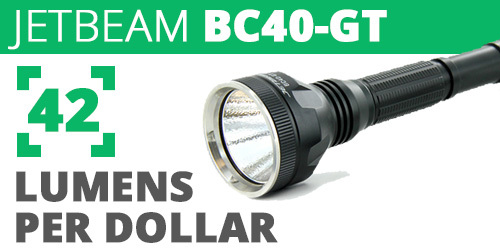 Long range illumination at a price that can't be beat, the Jetbeam BC40-GT comes with a stunning 42 Lumens Per Dollar! Running on either four CR123A or two 18650 batteries, this light can cast a beam up to 1138 feet! Perfect for long range spotting and late night adventures, the BC40-GT finds itself at home in the hands of casual users as well as emergency response professionals. 2750 Lumen output and an ipx-8 waterproof rating makes the BC40-GT ready for action in all weather conditions. Combine that with a simple tail-switch interface and you've got one of the most reliable lights around! 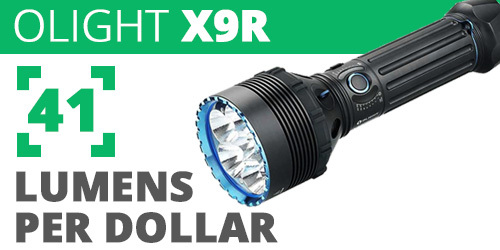 The X9R is Olight's newest addition featuring innovative illumination at a great value of 41 Lumen per Dollar. With a maximum 25,000 lumen output, This astounding flashlight combines sheer power with innovative features, rocking proximity sensors that can automatically adjust the beam brightness if an object steps in close proximity to the head of the flashlight. The innovation continues with the sides of the flashlight's activation switch featuring 8 blue lights that indicate output level, remaining battery life, and the charging status, giving you real-time accurate readouts at the tips of your fingers! 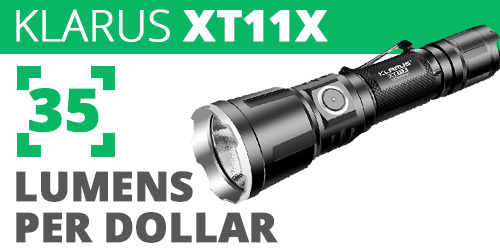 Klarus' XT11X is a heavy duty champion being the brightest single 18650 light on the market today. This monster torch measuring just 6 inches long offers an impressive 35 Lumen per Dollar rating, making it a strong contender outputting 3200 lumens of brightness. Such power is typically unheard of in such a compact light, but thanks to its powerful IMR 18650 power source (included) and it's efficient circuitry, the XT11X is able to outshine all its competitors! The only headlamp on our list, the Acebeam H30 pulls double duty as a high powered LED headlamp as well and a handy to carry angle light. Ranking in with a 33 Lumen Per Dollar rating, the H30 crushes the competition with 4000 lumens. 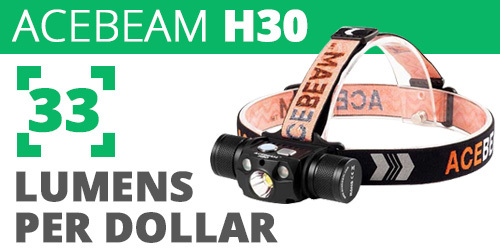 And if that wasn't enough, the Acebeam H30 also contains two auxiliary red and green LEDs that provide unique shades of light for late night navigation and hunting. The alternate colors and a wide range of light levels make the Acebeam H30 a perfect light for hands free situations. What better way to close the top ten heavy hitters than with a bang. The Nitecore TM10K does just that coming in at 33 Lumens per dollar. Offering a unique, smaller than a smart phone design, the TM10K is the ideal flashlight for any application. While its size may be modest, the Tiny Monster's capabilities are anything but, capable of producing a 7-second burst of 10000 Lumens and up to 2000 Lumens continuously. 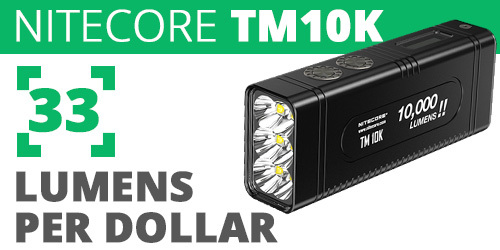 Making the TM10K a powerful and versatile light perfect for specialist and casual users alike.